Whiteway Lodge No. 8, Grand Lodge of Newfoundland and Labrador, Canada. Wor. Master (2009) of University Lodge #34, Grand Lodge of Newfoundland and Labrador, Canada. Why is memory so important to Freemasons? I'm sure to many of you, that will seem obvious. Yet, beyond memorizing material so that you can do things like prove up to a higher degree, perform your ritual part well, do the floorwork, deliver a charge or even deliver a tracing board, there is a great deal more to this topic than one might think at first glance. Thus, in this brief paper, I hope to sketch out three interrelated areas in which memory may - whether consciously or inadvertently - be of significance to Freemasons. The first use is, of course, the most obvious that I'm sure most Masons wouldn't question. I refer to this as the practical "how to" use of memory. Beyond the respective abilities that each Mason is naturally endowed with - either by birth or by dint of a good education, there have been from time immemorial various methods that Masons have used to artificially train their memory. Beyond mere rote learning, for example, I have heard of brethren who swear by speaking their parts out loud, performing their charges in front of a mirror, and so on. There are also books specifically for Masons in this respect (e.g. David Royal’s Masonic Mnemonics) and a plethora of material on the internet with advice on improving one’s memory (e.g. an article by Tamin Ansary entitled "12 Memory Tricks"). What I want to make clear to you is that such memory training techniques are not new. Whether used by actors, students, public speakers or Freemasons, some techniques go back to antiquity. Before the invention of printing, when manuscripts had to be copied by hand, writing materials were scarce and expensive, and many could not read and write, a trained memory was a valuable asset. Thus, ancient orators, aided by teachers of rhetoric, taught techniques enabling orators, politicians, priests, and others to memorize large amounts of material in great detail. This art of "artificial memory" is first attributed to the Greek poet Simonides who, the story goes, was able to remember everyone at a banquet where there was a terrible accident, having been called outside immediately before the roof of the hall collapsed. He recalled every guest in detail, largely based on their position and the images he associated with each (“rules for places, rules for images”). While many others after Simonides developed these techniques, the best example we have of this ancient art comes down to us in a Latin manuscript, by an anonymous Roman teacher of rhetoric, known as the Ad Herennium. This formalizes the theme that to memorize something, one must imagine various lines or parts of a story occurring in a particular building, with various rooms, and to associate different striking images with each room. As one imagines oneself walking through this architecture, recognizing the images in each, one is reminded throughout of the various parts of the story or text one is trying to remember. Incidentally, I recall one Mason telling a new initiate that, to remember the various lines in the catechism he had to memorize before proving up to the next degree, just to list off what he did and where he did it. Indeed, Masons also draw significantly upon architectural images in the memory process. These techniques were discussed and copied well into the Middle Ages, and there were innumerable elaborations and refinements on these themes, but it all comes back in the end to these two principles - using places and associated images to recall the details of texts one is attempting to relate to an audience. Yet, beyond the practical, "how to" use of memory, there is a second aspect: interpretation. This hermeneutic component has at least two parts. First is what I would call the sedimentary aspect, akin to what the Masonic Restoration Foundation calls "Masonic Formation." This involves the fact that the Masonic work we all do - I would assert particularly the active memorization - has a progressive impact upon who and what we are (e.g. think of it as smoothing the rough ashlar). What I'm suggesting is that we do not only memorize material, we gradually internalize it - from the outside in - and in so doing gradually act to change who and what we are in a more moral direction. Indeed, this shaping may be so gradual, changes in our actions and character can occur almost imperceptibly, yet come to operate almost at the precognitive level, affecting our perceptions, interpretations, even our actions (not to mention the many conscious changes as well). Historically, this was also the case in the Middle Ages, when sermons were memorized by clergy not only to deliver to their flocks, but to have a simultaneous constructive impact upon their own thoughts, interpretations and actions (i.e. artificial memory as a devotional exercise). Might I add that the art of memory, during the Middle Ages, was officially classified by St. Thomas Aquinas part of the virtue of prudence. (3) the Mason himself (reflective of his personal and social background). The first is noted by Masons who travel to other lodges and jurisdictions and observe familiar things being done differently, often remarking that they get something different out of it as a result. The second factor is seen in the often differing experiences of active lodge officers vs. "benchers" (the latter more often 'social Masons' taking basic moral meanings, except for some who were once quite active but are now stepping back). It is also seen in comments that working/memorizing different offices, such as SD or WM result in different perspectives emerging on the ritual. Yet it is the third factor, the Mason's background, that may be of much more importance than many believe. This sedimentized memorization of ritual always takes place in one’s personal and social context. Thus, respondents in my interview research were often quietly willing to recognize that educational background may have an impact on how Masons interpreted the ritual, drew parallels and read in analogies, at least initially (since some point out less educated brethren who have developed a deep knowledge over time). Fewer considered that culture, religious or occupational background might play a part (e.g. immigrants, Catholics, WWII bomber pilots, prison guards). Most would deny, however, that things like class and race were significant to the active interpretation of the ritual, despite the fact, for example, that traditionally (i.e. in the “old days”) respondents report that Masons were largely prominent people like bankers and lawyers, and that part of the membership draw was to be "on the level" with them. As for neglecting race, this overlooks striking examples, such as the African-Canadian man who, unlike anyone else, struggled over the term "free-born" when joining Masonry. Thus, beyond what is internalized in memorization, when engaging the interpretive element of this faculty, it is very important to be cognizant of the Mason's social background when considering the meaning, the interpretation actively constructed through ritual memorization. Interpretation is a two-way street. So, up to this point we have considered the role of memory in light of practical memorization techniques and its hermeneutic, interpretive aspect. Yet there is a third aspect of Masonry with a much more esoteric history, only the bare outlines of which I can discuss here. This goes back at least to ancient Greece, where Plato, given his general theme that we live in a world of shadows, partialities, and imperfect facsimiles of what is truly real, argued that we do not learn, but remember. One of Plato's main themes, in fact, was that "learning is remembering". Now, I haven't got time to take you through the complex history of this idea. Let's just say that such ideas became popularized through both late antique neoplatonism (emerging from Plotinus and others) as well as the Corpus Hermeticum - a document written in the second century purporting to be written by an ancient Egyptian priest. Both were associated with pantheistic and magical ideas and practices (the macro/microcosmic idea that "as above, so below", with its corollary that selective actions taken in one realm can influence the other). Plato's ideas were influential both on the surface (e.g. on St. Augustine and the Medieval church) and more subversively. Yet, during the Italian Renaissance, they took on a newfound vigor and influence. Marsilio Ficino was given a copy of the Corpus Hermeticum to translate and, due to an error in dating, along with certain doctrines that seemed to anticipate Christianity, it became a key text in the Italian Renaissance. Ficino started experimenting with symapthetic magic,  Pico della Mirandola mixed it with Kabbalistic images, and Cornelius Agrippa added theurgy, all in an attempt to mix complex memory systems with magic. Needless to say, this also came to have much to do with alchemy as time went on. 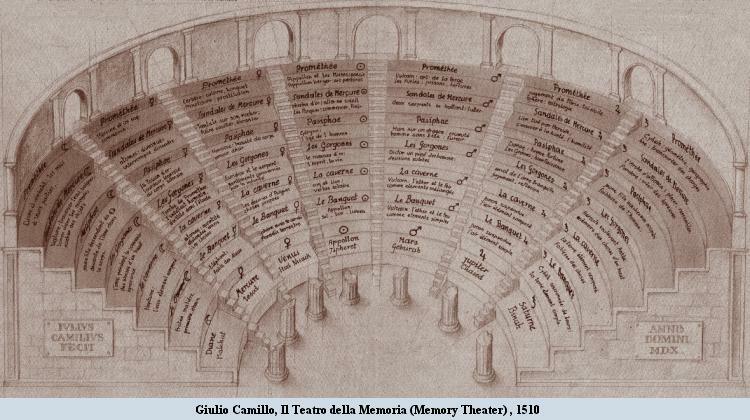 Some, such as Giulio Camillo, even went so far as to create complex theatrical edifices where the artificial memory was mixed with magical and experimental practices. This has all come a long way from simply trying to remember text. "the classical art of memory, in the truly extraordinary Renaissance and Hermetic transformation of it which we see in the memory system(s) of (Bruno), has become the vehicle for the formation of the psyche of a Hermetic mystic and Magus. The Hermetic principle of the reflection of the universe in the mind as a religious experience is organized through the art of memory into a magico-religious technique for grasping and unifying the world of appearances through arrangements of significant images...(This Renaissance occult tradition) exhibits a profound conviction that man, the image of the greater world, can grasp, hold and understand the greater world through the power of his imagination... (as such, the art of memory) has become man's highest power, by means of which he can grasp the intelligible world beyond appearances through laying hold of significant images." So, what we have here are three possible uses of memory in Masonry - some obviously better known and understood than others. I would suggest that these are nested inside each other like the layers of an onion or those Russian toy dolls. We readily see the outside one - the practical method. We become gradually more aware of the interpretive element through engaging in ritual practice. But the third, the esoteric or mystical method of memory is most hidden, it is far inside – “in the centre”. I suspect that each of these three aspects of memory are utilized, to differing degrees by different Masons - it is just that some are more aware of it than others. "I would think that the answer to this problem may be suggested by the history of the art of memory, that the Renaissance occult memory, as we have seen it...and fervently propagated by Giordano Bruno, may be the real source of a Hermetic and mystical movement which used, not the 'real' architecture of 'operative' Masonry, but the imaginary or 'speculative' architecture of the art of memory as the vehicle of its teachings. A careful examination of the symbolism might eventually confirm this hypothesis. David Royal (2008). Masonic Mnemonics. (Lewis Masonic). Tamin Ansary “12 Memory Tricks. Frances Yates (1966). The Art of Memory (London: Routledge and Kegan Paul Ltd.) pp.1-2. Ibid, pp.5-6; 50-58; 89-90; 99; 103; 105-109; 199; 223; 233; 247, 268; 274; 294; 302; 327-28; 333-34; 380-81. St. Thomas Aquinas, Summa Theologica II, II, 49. J. Scott Kenney (2008) Social Research on Freemasonry: Some Initial Impressions. For example, a Mason who had served as a bomber pilot during the war interpreted the three degrees as reflective of: (1) basic military training; (2) the technical knowledge imparted in flight training; and (3) aerial combat, where one is unsure about one’s survival. He would be unlikely to have constructed this interpretation without his background in the air force. Yates (Supra), p.147-148; 156-58; 172; 223-224; 230; 254-55. Yates (Supra), pp. 148; 150-51; 198.